Desolate campsites, gorgeous scenery: Bikepacking takes you faster than hiking to places you can’t reach by car. Before you go, learn from the mistakes I made during my first two-wheeled camping adventure. Along with a group of product designers and media reps, I decided to test drive REI’s bikepacking-specific bicycles, apparel, and lightweight camp gear. 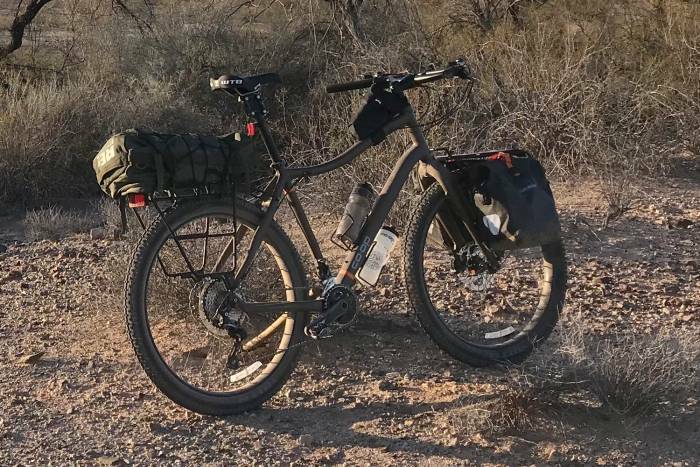 I’d long been curious about rigging up a bike as a means to access remote areas. 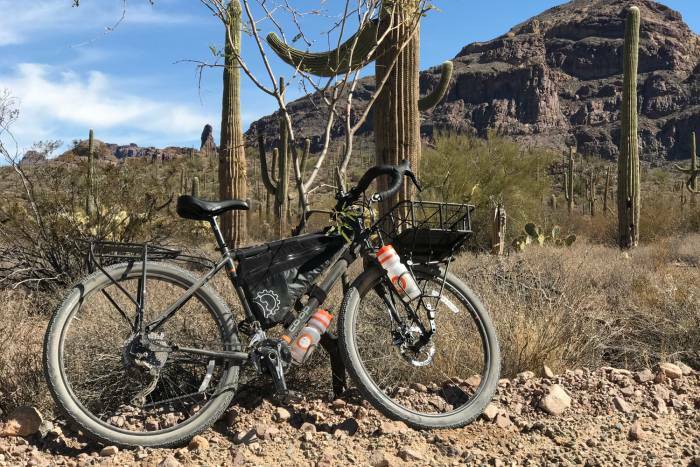 But pedaling beneath the Sonoran Desert’s scorching sun, I felt like a melting Gumby. For three days, I fumbled with bikepacking basics – from shifting gears to properly tightening down my load. 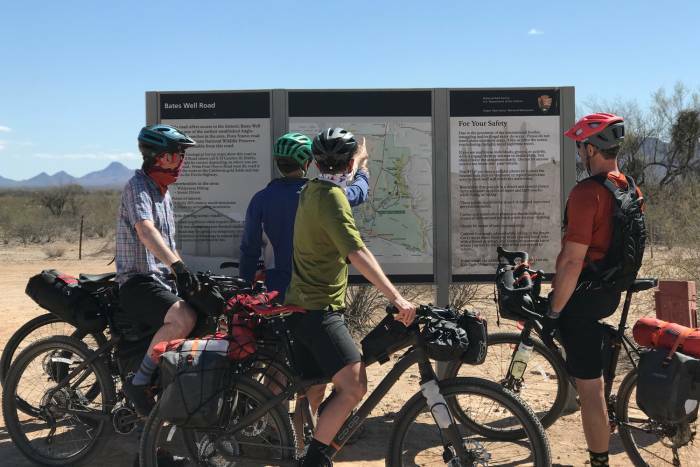 Our 100-mile loop took my group from Ajo, Ariz., through Organ Pipe Cactus National Monument, and along the Mexican border. That proved an epic route for my inaugural trip. Rocky dirt roads, seas of sand, and sun-baked pavement – dotted with potholes provided a veritable obstacle course. The learning curve was steep but fun. Here are a handful of mistakes I learned from right off the bat. Whereas others brought their own clipless pedals and cleats to outfit the test bikes, I brought flat-soled shoes and platform pedals. More often than not, I wished I had the power of the upstroke. The exception was when I surfed long sections of deep sand and had the freedom to arrest a fall by sticking my foot out. But those were few and far between. The superior efficiency of a clipless pedal system is extremely helpful during long rides with a loaded bike. I loaded a cone-shaped saddlebag and strapped it to my seat post. It fit great – when the ride wasn’t bouncy. Given my torso-to-leg ratio, I situated my seat low to the frame. Gravity continually pulled on the fully loaded bag, and it didn’t have enough clearance above the tire. Eventually, the tire burned a hole right through the sack. I ended up adding a rear rack and redistributing my gear to other bags. I then replaced the large saddlebag with a smaller one, and everything was good to go. 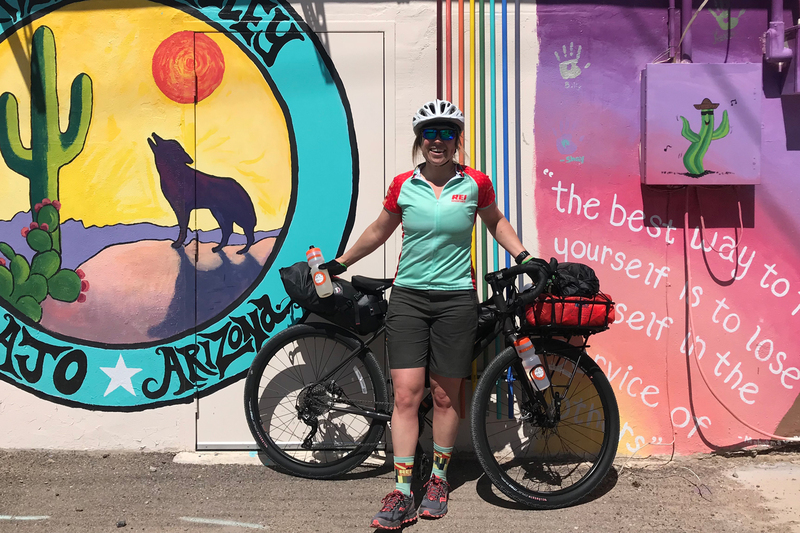 The lesson: Make sure you have the appropriate gear for your specific bike and bikepacking setup. Redistributing weight to a frame bag added stability. But I realized after a few miles that my hips aren’t wide enough for the stuffed configuration. Unfortunately, the insides of my knees chafed against the wide bag. I found two solutions. First, minimize bulge by not overpacking a frame bag. 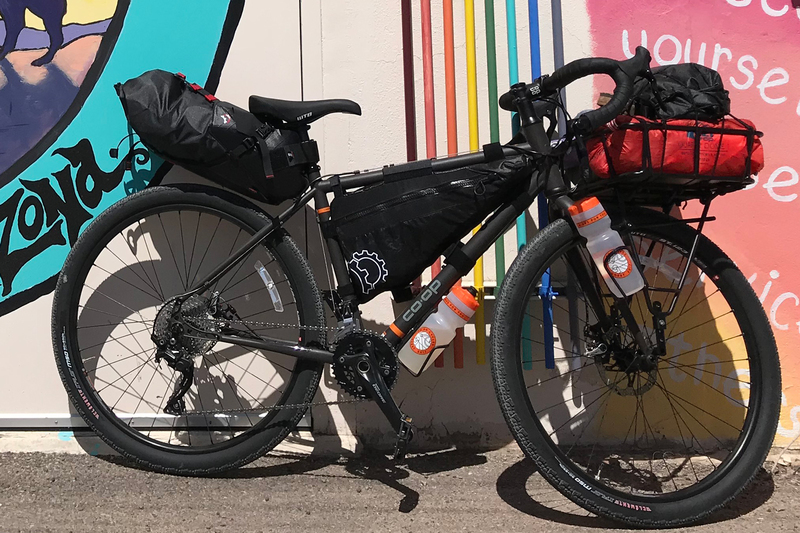 Second, configure your bikepacking setup so that it’s comfortable. 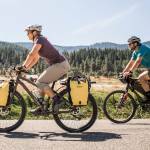 That means distributing weight between packs on your person, racks, bags, and panniers. Find the distribution that works best for your body’s shape, size, and center of gravity. If I was Gumby, REI’s new ADV 3.1 adventure touring bike was my noble sidekick, Pokey. The bike was stable for a heavy load and variable terrain while lacking a car’s suspension. By day three, I discovered the glory of releasing a bit of air from the tires to provide extra shock absorption. It was perfect for bumpy, washboard descents. For easy access, I kept my cameraphone in my jersey’s back pocket. Stopping to photograph the landscape was great, but it proved ill-advised for the conditions. Despite it being only 70–80 degrees Fahrenheit outside, my phone, sandwiched between my body and the desert sun, overheated. The next day, I moved the camera to my frame bag to better protect it from heat. Every ounce you carry counts. To ensure you’re not lugging around a ton of extra weight, it’s important to pack only the essentials. The less gear, the better! 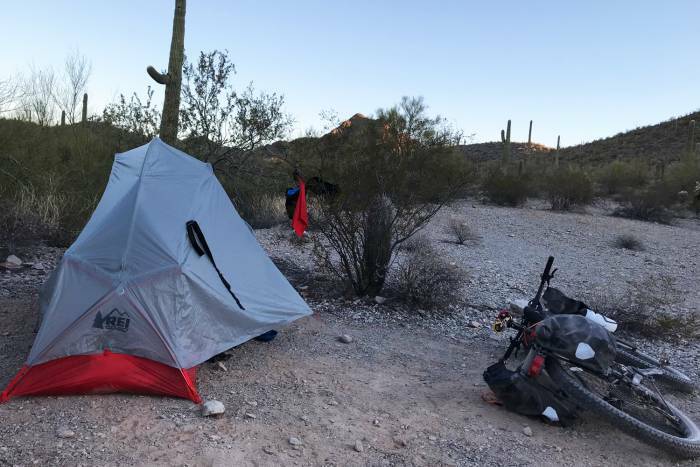 My kit consisted of a couple footwear options, extra chamois padding, Beyond Coastal active sunscreen, a towel, REI’s Quarter Dome 1 tent, a sleeping pad, and a women’s Magma 17 sleeping bag. Halfway through night one, I realized my sleeping pad was a dud and wouldn’t hold air. For the remaining 75 miles, I didn’t use it once! And I could’ve left behind my camp towel – baby wipes are adequate – and a smattering of apparel I never used. The important thing is to not be intimidated by the possibility of failure. Get out there with a crew that loves exploring and has a great attitude. During the inevitable moments of muscle pain, you’ll still have a rad time. Oh, and the weather: Check it, check it again, and pack necessities accordingly. Your body will thank you. Who knows? You might even become hooked on two-wheeled adventures.